Keep it classy with Star Wars and astromech droid R2-D2! 100% Italian Silk Necktie features a cool R2-D2 silhouette pattern. Measures 59-inches long x 3 1/4-inches wide. Keep it classy with Star Wars and the brave little astromech droid R2-D2! This Star Wars R2-D2 Pattern Tonal Blue Italian Silk Tie measures 59-inches long x 3 1/4-inches wide and is made from 100% Italian Silk. 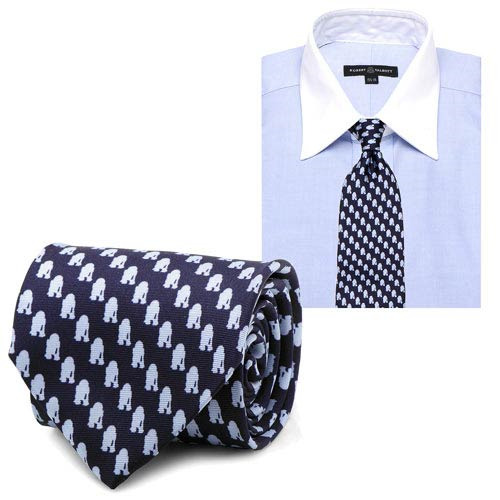 Featuring a navy blue base color with a pattern of R2-D2's silhouette decorating it in light blue, this tie is a must-have for Star Wars fans who are in need of some nice formal wear. You'll be able to attend any stuffy event decked out in the coolest geek gear - all while being able to keep your love of Star Wars a subtle secret for anyone who isn't taking a good look at your tie! Ages 18 and up.